Psalms 19:7 The law of Yahweh is perfect, converting the soul: the testimony of Yahweh is sure, making wise the simple. Misdirection is a form of deception in which the attention of an audience is focused on one thing in order to distract its attention from another. May 23rd 2015 at even til May 24th 2015 at even, marks the observance of the Feast of Pentecost also known as the Feast of Weeks, which is commanded in the biblical book of Leviticus, chapter 23. But like so often that fact is largely ignored by media and popular culture and overshadowed by the “fun” to be had at Memorial Day barbecues and celebrations. But what exactly is Memorial Day celebrations about? The pagan deities Hades, Pluto, and Grimm Reaper are also known gods of the dead. The practice of visiting graves is leftover from the worship of these pagan gods. Biblical Law shows us how to maintain spiritual clean-ness in staying away from such pagan practices. Numbers 19:16 And whosoever toucheth… a grave, shall be unclean seven days. Even the common practice of eating after a funeral / burial, also called a repast, is part of the pagan practices of death worship. Just like the flowers left on graves, the food eaten after funerals ARE SACRIFICES / offerings to the dead and to the god of the dead. This is what Psalms 106:28 “They joined themselves also unto Baalpeor, and ate the sacrifices of the dead.” is speaking about. Misdirection from Yah’s ways are common, but learning His ways and being obedient in His ways points us towards truth and salvation. Feast of Pentecost – 5/23/2015 at even! Leviticus 23:15-16, 21 “And ye shall count unto you from … the morrow after the seventh sabbath shall ye number fifty days; and ye shall offer a new meat offering unto the LORD. …And ye shall proclaim … that it may be an holy convocation unto you: ye shall do no servile work therein: it shall be a statute for ever in all your dwellings throughout your generations. Fifty days after the Feast of Unleavened Bread is the Feast of Pentecost. Pentecost literally means fiftieth day. This feast is also called the Feast of Weeks because it is also seven weeks following the Feast of Unleavened Bread. It is on this feast day that the Holy Spirit was bestowed upon the apostles and gave them the ability to speak in various languages. The people that were there heard and understood each man in his own language. Acts 2:1-11 “And when the day of Pentecost was fully come, they were all with one accord in one place. And suddenly there came a sound from heaven as of a rushing mighty wind, and it filled all the house where they were sitting. And there appeared unto them cloven tongues like as of fire, and it sat upon each of them. And they were all filled with the Holy Ghost, and began to speak with other tongues, as the Spirit gave them utterance. And there were dwelling at Jerusalem Jews, devout men, out of every nation under heaven. Now when this was noised abroad, the multitude came together, and were confounded, because that every man heard them speak in his own language. And they were all amazed and marvelled, saying one to another, Behold, are not all these which speak Galilaeans? And how hear we every man in our own tongue, wherein we were born? … we do hear them speak in our tongues the wonderful works of God. Cinco de Mayo & Mother’s Day: Not so wholesome…. 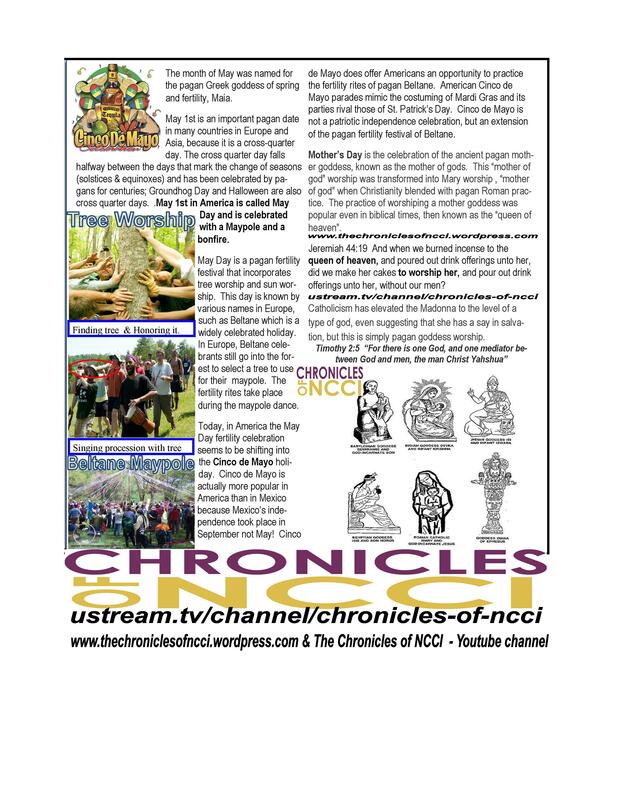 Tags: ancient Roman History, cinco de mayo, elder Yachov ben israel, Hebrew Israelite, holidays, Mother's Day, NCCI, pagan holidays, paganism, Yahshua, Yahweh, YHWH | Permalink.